It's hard to believe but eight years ago today, this little firecracker was born. I clearly remember getting a call from Jo-Anne. She needed me to come over to watch Jesse because they were headed for the hospital. It was around dinner time, so I packed an overnight bag and hit the road. When I arrived at their place, they were just finishing up Swiss Chalet take out. I stayed with the Peanut while Jo-Anne and Nick set off for the hospital. When he finally arrived (just before midnight) he had a shock of dark hair and the cutest little face. We were all thrilled to meet the newest member of our family. Since then, I've watched Liam grow into quite the little character. The things this kid comes out with are hilarious! He makes some very interesting observations sometimes and it's like he's an old man trapped in a little boy's body. Liam has a great sense of rhythm and music and is constantly bee-bopping to his own beat. He is passionate about food and loves helping out in the kitchen. 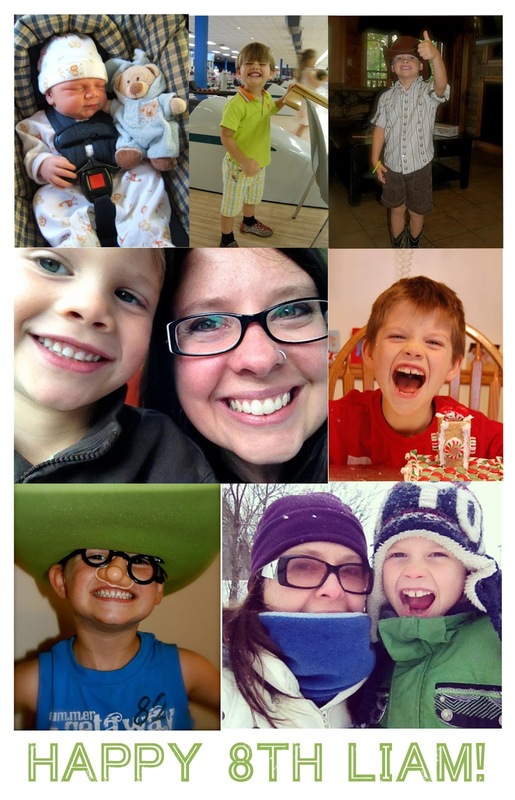 This little guy has added much joy and laughter into my life and today I'm happy to celebrate his 8th birthday.